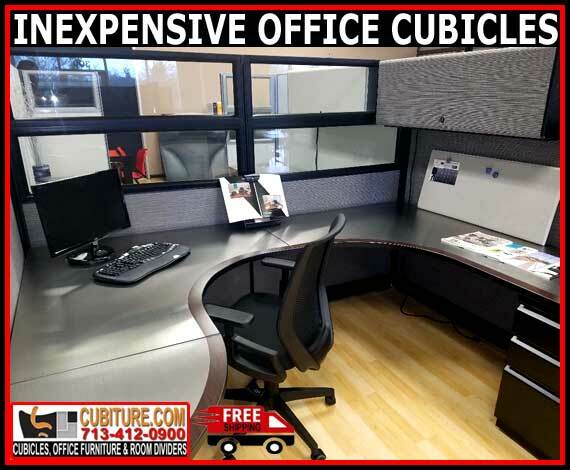 It doesn’t matter the size, industry, or budget of your business many industries can still benefit from the use of the inexpensive office cubicle as their key office furnishing for accommodating daily workflow and operations. Over the last few years, the idea of office environment design has changed with the goal of creating happy and productive employees. This has recently included a tendency toward the open-plan office, whose purported benefits had not just philosophical implications but cost implications as well. Not only would they unshackle employees from the confining monotony of office cubicles but also free the company itself from unnecessary costs that were associated with paneling and furnishings. Aside from finding out that the best office layout might actually be a blended open/closed concept, a traditional office environment still lets you avoid either fate. Thanks to inexpensive office cubicles, you can still witness a successful office environment that delivers the right workstations to encourage worker diligence, happiness, and individuality, all without breaking the bank. Do you run a small family company seeking a workstation that’s both low-cost and high-quality? Are you part of a startup, where you currently need to exercise conservative control of business funds? Are you currently in the process of rehiring new employees after having gone through a recent layoff? Are you perhaps operating in a rural area or a small town? Our inexpensive office cubicles offer a nearly infinite degree of customization in order to meet the needs of your unique company at a reasonable price. As long as you’re looking to create an environment that promotes collaboration while also valuing privacy needs to improve individual focus, then we’re sure to have an inexpensive office cubicle that can deliver for you. Since cost does fluctuate with the material, size, and features, our experts at Cubiture are more than happy to give you a free consultation where they can guide you to a great-looking workstation that fits your budget as well. The material that comprises your inexpensive office cubicle makes both a visual impact as well as a cost impact too. Cubicles can be fashioned from many different materials that in turn have hundreds of possibilities on the basis of color, finish, texture, grade, size, and price point to name a few. This is one reason why you should never make the mistake of confusing a low-cost material as a low-quality one. Just think of how many people you know enjoy the natural look of wood in their office space. Natural wood does stir the senses and can even have a calming effect in any office it graces, but it can also be just too expensive to justify its use in the office when a company wants to keep its costs on the low end. For inexpensive office cubicles, considering such high-quality and durable alternatives as high-pressure laminates and wood veneer introduces you to an extensive range of solutions that have the same natural look and quality of but at a much lower cost. There are enough finishes and colors at hand that allow you to coordinate your inexpensive office cubicles with nearly any possible interior design choice. The overall sturdiness as well as their high resistance to scratches and dents no doubt leads to a long and low-maintenance life as well. Fabric is a very popular option, especially when you’re in an open-plan office that’s rife with distraction and you’re looking to reduce the noise in your space. As a highly sound-absorbent material, fabric can help your inexpensive office cubicle dampen environmental sound and echoes in order to lighten the noise load and keep the user within focused on their individual tasks. Fabrics, like high-pressure laminates and veneers, can come in many different colors and textures to suit your unique tastes. Regardless of your choice in material, the height of your partitions is another way that you can add appeal to your inexpensive office cubicles. Since they can reach as high as five feet, high partition panels can easily isolate users as well as make it more difficult to bring in ambient lighting. Low walls, coming in on the opposite end at around 42” high, might be perfect for collaborative settings, but expect very little by way of individual visual and acoustic privacy. It’s best to find a good middle ground in medium-height walls, which roughly measure around 53” high. Naturally, all things being equal, lower walls don’t just allow a healthy balance of personal privacy and social interaction; they’re also lower in cost due to less material being used. Glass panels can also add spaciousness to your inexpensive office cubicle. They can emit a good amount of crucial ambient lighting and add a sense of connection to one’s own work environment without completely removing any physical boundary that allows for a degree of personal privacy. It’s important to note that while glass can be an expensive addition to an office cubicle, its strategic use can lead to more employee comfort without surpassing your budget. Other various features that can add another dimension of customizability to your inexpensive office cubicle are storage and organization elements. Binders can find their home in trays which are often suspended by hooks and rails as a convenient way to clear your worksurface. Loose paper documents can be stored in cubby holes and drawers designed for storage and files. Overhead storage bins and different variants on the bulletin board can conveniently store even more materials out of the way in a more or less hidden fashion. While all of these features can be attractive and useful as part of your inexpensive office cubicle, you can keep costs down by assessing whether you really would need them. What good is the extra cost of built-out cubby holes, binder trays, and file drawers if your office is paperless? If your office still uses paper, why bother having a rail and hook system to support binder trays when a more general-use overhead storage bin can suffice? If the nature of the company or just one’s personal workflow doesn’t necessitate them, then neat storage features can quickly become a nuisance that leads to clutter, discomfort, and distraction. With your knowledge of materials and features, along with their potential and limitations, you can truly allow your quality inexpensive office cubicles to live up to their name! At Cubiture, we are happy to work closely with you to determine the best inexpensive office cubicles for your business and office needs while being attractive too. We offer free estimates with no obligation to buy. We also strive towards short lead times when delivering your office cubicles free of charge, as well as offering continued maintenance and repair programs. Don’t hesitate to call Cubiture now at (713) 412-0900!